I think people do more cooking in the last three months of the year than almost all the others combined! We are cooking huge meals for family and friends and baking treats for our sweet tooth. If you are the cool in the family, you are spending more time in the kitchen cooking and baking than in any other room! If that is the case, I hope you have the right tools to make your job easier and more enjoyable. If you are a cook or need great gifts for the Top Chef on your list, Architec Products are unbelievable! I got my love for cooking from my mother who made virtually everything from scratch. Although I am pretty darn busy, I try to do the same whenever I can. We have done a little baking so far and we will be doing more when my oldest daughter comes up next week. For Thanksgiving we made a pie and some cookies and I make some homemade soup. I can tell you you can make cooking easier with these top gifts for the chef from Architec. They absolutely made my day in the kitchen a lot more enjoyable with the products I received. Their items are sleek, modern, colorful and made to assist you in your foodie endeavors. From their Scoop Colandar to their Flex Cutting Board, Architec has some really cool kitchen tools! I received the Holdbowl™ Mixing Bowl, which sells for $14.99 and can be purchased on their website, Target, Bed Bath and Beyond and other fine stores.The bowl, which comes in red or white, has a very cool flexible handles which allows you to hold the bowl in three different ways for best comfort and dexterity. 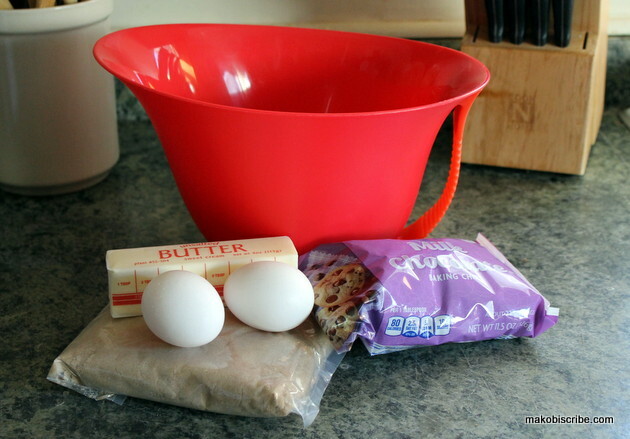 It made mixing our cookie ingredients so much easier than anything I have ever used. With the easy to ppur spout, you can our batters directly into your pan without making a big mess. I also received the Original Gripper™ Cutting Board, which can be purchased $19.99 and is available in 6 bright colors. I love this cutting board because when you are cutting, the board stays put, making cutting easier and safer. I hate to cut or chop, especially vegetables and the cutting board slides and you about cut your finger off. Not with this cutting board! It is also very easy to clean and can be put in the dishwasher if you prefer. You can also find wet/dry funnels, tool and recipe rests, scrubbie sponges and more from Architec. I like the black bamboo cutting board as well as this gripper mixer. Architec Black Bamboo Cutting Board. The Air Dry Wine Glass Drying Rack! Would also love many of their wonderful cutting boards, the Recipe Rock, Gripper Colander and Hot Grips! I’d love to have the Purelast Measuring Cups. I want the Gripper™ Colander!!! Well i really like the Gripper wood gourmet cutting board it looks nice. I would love the Black Bamboo Chopping Block. I like the Stackable Appetizer Maker! I like the ArchitecTM Preps Colanders (4Quart MCMB). I like the flex cutting boards! I’d love the Air Dry™ Wine Glass Drying Rack! This would be so perfect! i like the black bamboo cutting board. thanks. I’m in love with the purple and white polka dot knife you have in this article. I also like the black bamboo cutting board. The five minute stackable appetizer or the recipe rock. I like the FLEXPOTO7. It is a cutting board that turns into a scoop so you can easily transfer your chopped veggies. Love this product! I really like the Farmhouse Bamboo Cutting Board!!! We don’t have much counter space, the Gripper Barboard would be a great addition. I like all of the products, but I would love to have the black bamboo cutting board. I really like the Architec™ Black Bamboo Cutting Board. I would like Scoop Colander. I love this for my chopping and cooking Flex Cutting Board Ribbit and I love the green color. The stackable appetizer maker looks awesome! I could definitely use a new mixing bowl. I really like the Architec Gripper Barboard. Thank you for the super giveaway opportunity. Keep up the terrific blogging. Like the Simplicity Paper Towel Holder. I love the Air Dry™ Wine Glass Drying Rack! Hard to choose! The Mixing bowl would be great! I like the mixing bowl in white the best. thanks for the giveaway I like this one! I need funnels so I would like the prep wet/dry funnels. I really love the design of the scoop colander. This would be very handy for rinsing veggies! I like the Original Gripper™ Cutting Board. I love the mixing bowl for sure, plus the gripper colander. The mixing bowl – I actually need some of those. I like the cutting board too, but I do have at least one of those already. i like the mixing bowl, but anything would be better than the hand-me-downs that i currently have! I always love new mixing bowls! Also love the Gripper Colander. I like the scoop colander!! I like the hold bowl mixing bowl. I am IN LOVE with this mixing bowl! I like the 4QT Gripper collander. I like the Smart Scrubbies Kitchen Sponges. I love the mixing bowl. i would love to have the Gripper Colander! mine is metal and getting rusted out! the black bamboo board looks good to me. I like the scoop colander and the grip colander. I like the bowl, but I need a colander. I like the black bamboo chopping block. I love the Architec™ – End Grain Black Bamboo & Natural Bamboo cutting boards. The Gripper Colandar looks neat. I love the air dry wine glass drying rack! there are so many products that caught my eye there. The gripper cutting boards are amazing, but the black bamboo cutting board is beyond stunning…but as we have no dishwasher, I’m most intrigued by the smart scrubber sponges! I like the Scoop Colander. I like the Borboard Gripper! I love the Scoop Colander! What an amazing idea! I like the Farmhouse Bamboo Cutting Board. I would like the Original Gripper™ Cutting Board. The Five Minute Stackable Appetizer Maker looks cool! My cutting board seems to be on it’s way out! I would like their “Gripper” cutting board set. I like the Gripper™ Colander. I like the Gripperwood Gourmet Cutting Board. It’s beautiful, and use-every-day practical, too. I want the Stackable Appetizer Maker. I love the https:Gripper Barboard. I used a smooth one today and almost had an accident–dish almost slide right onto the floor. Pretty colors too.